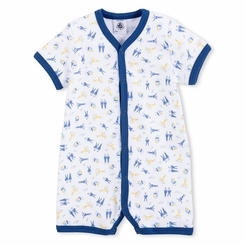 Made from cotton, this baby boy's shortie is distinguishable because of its vintage print and nautical spirit. We take notice of the poppa opening on the front of the shortie. A baby garment that's perfect for summer! Material: 100% cotton.